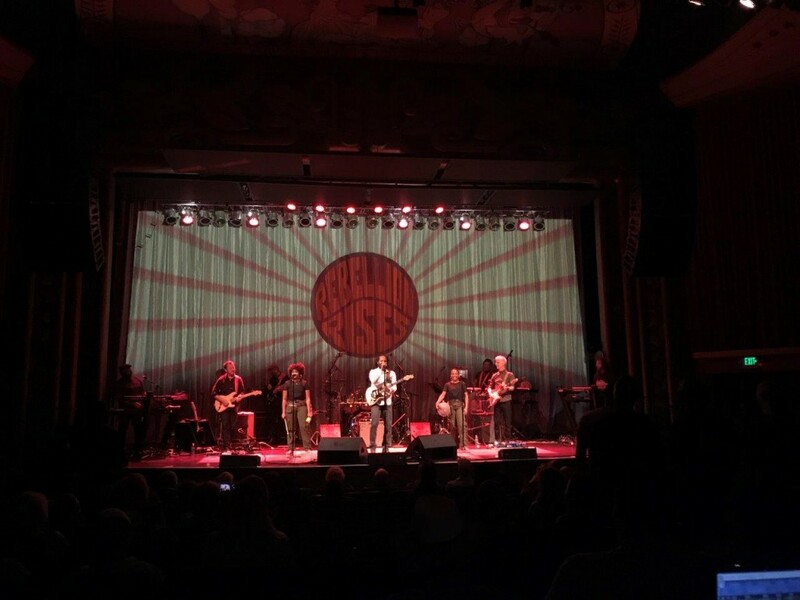 Recently, our Senior Account Manager Shane Nelsen was thrilled to work with the extremely artistic and talented Joel Huxtable, who is the tour manager for Ziggy Marley’s spellbinding international concert tour. He wanted to buy some drapery that would be tour-friendly, and not become a “wrinkled mess” at each new venue. They were also looking for pleated drapery that would look lovely all on its own, but also be reflective enough to allow their lighting designers to project some innovative and gorgeous lighting patterns and colors onto them, cleanly and beautifully. They decided on a custom-built, tour-friendly single 24’h x 40’w Inherently Flame Retardant (IFR) Silver Textura backdrop, with hidden/sewn ties on top and box pleating to add some attractive fullness. This allowed a seamless look onstage, as well as a tidy truss-line, too. Textura is one of the most reflective and eye-catching materials available, and the drape looks utterly breathtaking in mere natural lighting. However, adding and changing the colors of the lights being splashed onto them gave this backdrop incredible versatility… producing absolutely stunning results. 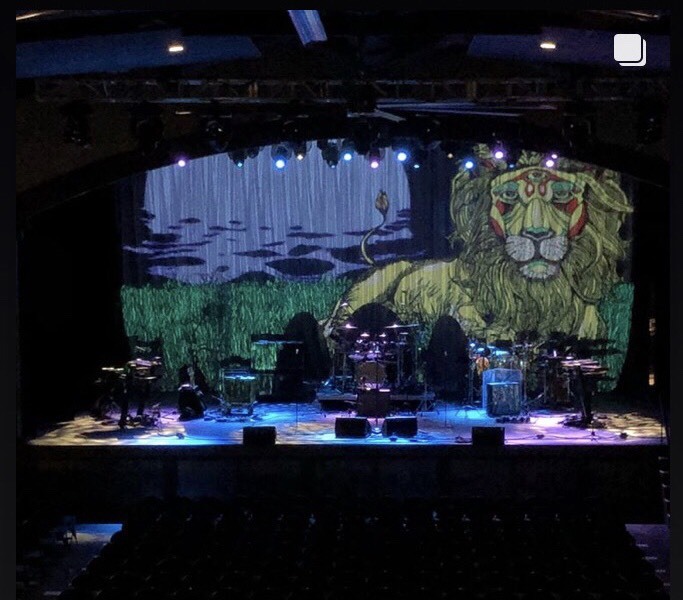 The tour’s lighting designers are able to project colorful lights and gobos onto these drapes to facilitate a change in the overall feel between different segments, song sets, and show pieces—rendering a wonderful design that is much more riveting. This straightforward, yet remarkable, curtain helps the tour’s designers create stunning and distinctive looks for their all of their shows that are genuinely distinctive and completely unique. 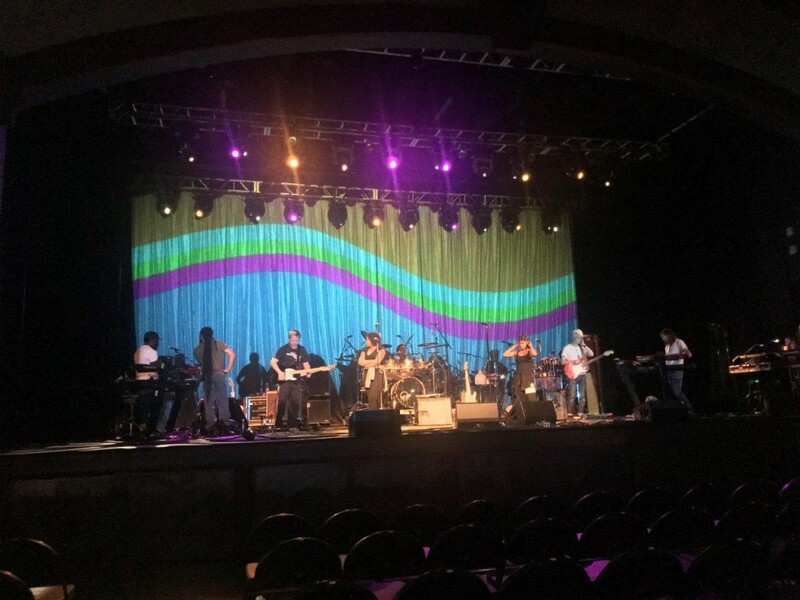 Changing the lighting scheme with sensational colors patterns and images also helps them create exceptionable motifs for each part of Ziggy’s concerts, and enables them to design dazzling, exclusive looks for this current tour that are truly unforgettable. Photographed superbly by band photographer Jerry Borge, you can see how this style of Silver Textura drapery is a lighting designer’s dream come true—making it the ideal backdrop for all kinds of special event and production designs. Not ready to purchase your own custom theatrical drapes yet? You can rent some comparable pieces from our Silver Satin Collection, too. Our rental drapery layer effortlessly with one another to help create exclusive and memorable looks for all of your rock and roll tour needs. Because they are so versatile and eclectic, they can become even more magnificent by simply layering them with drapes from ANY of our dynamic drapery collections. Contact one of our drapery specialists today to help you decide on the most perfect stage curtains for your upcoming special event or concert tour. We’re here to help provide you with drapery that can be rental, purchase, or a combination of both for your one-of-a-kind stage. It always impresses me so much to see how our creative clients come up with such unique ways to incorporate soft goods into the overall design of the stage. This one had some of the most extraordinary lighting effects I’ve ever seen, especially on pleated curtains. Truly remarkable!